Comments are now closed on this post. I'll be emailing the first five commenters privately. It’s first come, first serve. Once the five people have commented, I’ll close the comments and shoot each of you an email directly so make sure that you leave a valid email address. From there, shoot me a self-addressed stamped envelope and I’ll send a sticker right back to you. 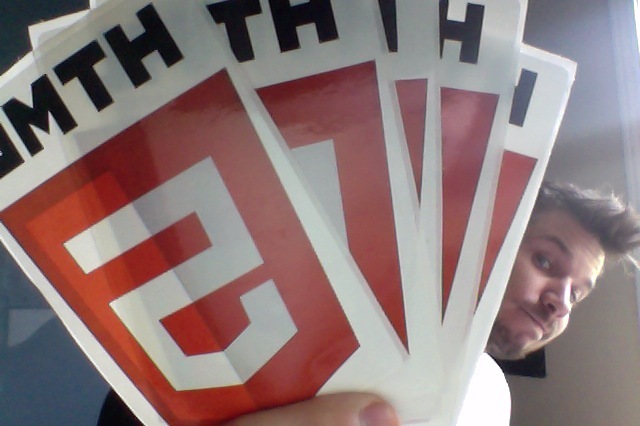 Five HTML5 stickers. Fun :). I’d love to get one of these! HTML5 is really an amazing re-invention of HTML! I’d like to have one !!! i’d love to have one of it there are so crazy !!! Yikes – looks like you’re #6 :). If it doesn’t work out for someone else, I’ll touch base with you! I’d like to have one as well! I apparently mis-counted…#7. Sad day. You’re next in line of two others can’t make it, though!